This particular lamp represents the earliest style of quartz mercury lamp sold in quantity by the company. It employs the original type arc tube and the date code of 723 can be translated into its manufacture date being December 1937. 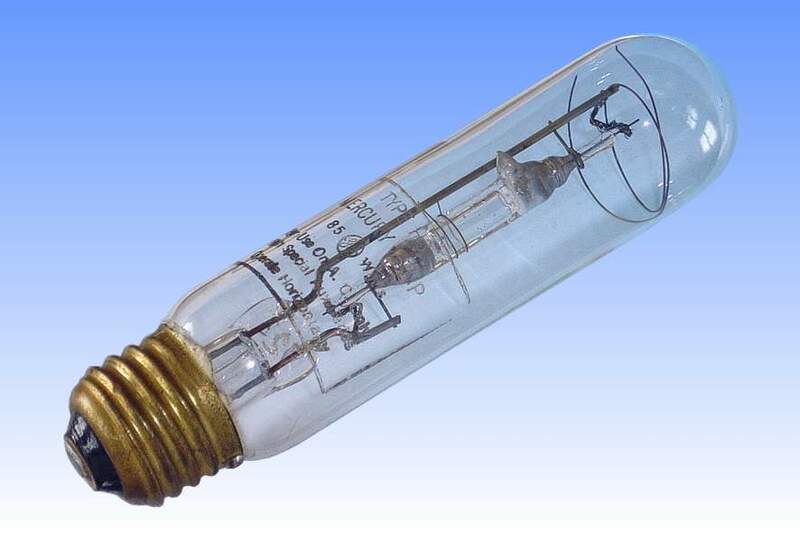 The first mercury lamp placed on the American market was the H1 having a hard glass arc tube and rated 400 Watts, but lamps of lower wattages soon became quite desirable. A 250W H2 lamp was introduced but it was not possible to make lower wattage lamps with high enough efficacy to make them commercially viable. Lower power lamps need to operate at higher temperature and pressure to keep them efficient, and the special aluminosilicate glasses developed for the H1 and H2 arc tubes were not sufficiently refractory. 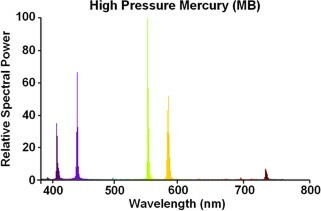 Quartz has a much higher softening temperature, but it was not until methods has been found of chemically purifying it to lamp quality levels that it could be adopted. Even then, sealing metal wires through it was very difficult because quartz expands and contracts at a rate ten times slower than most metals. This very early GE lamp shows an early attempt to make the quartz to metal seals, based on the work Philips had conducted in Holland three years earlier. Thin rods of tungsten are glazed with a hard silica-rich glass, and two intermediate glasses of lower expansion coefficient are built up around it in a bead. The bead can then be successfully sealed direct to the quartz arc tube. It is interesting to note the constrictions ahead of the electrodes in the the side of the quartz arc tube wall. These served to keep much of the sputtered electrode material at the tube ends, and greatly improved lumen maintenance. References: 1) Mazda Lamps Bulletin LD-1, C.E. Weitz, General Electric, 1939. 2) Fluorescent and Other Gaseous Discharge Lamps, Forsythe W.E. and Adams E.Q., Murray-Hill Books 1948.